This was a journey that was booked at the last moment. I had to rush home for an emergency - I took a flight to go home (a ticket booked for a cheap price, at the last minute - I decided to enjoy that flight, and did not make note of the timeline at all). After my work at my home down was over, I headed out to Kodungallur town. A new bus service was being launched from my hometown to the temple town of Kollur (Mookambika) in Karnataka. I decided to attend the program - which went on till evening. 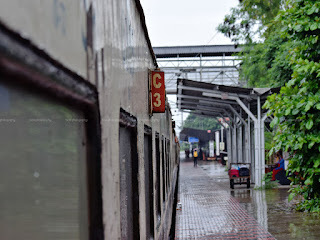 I also decided to make a journey on the first trip - I was to travel to Kozhikode. Being the inaugural trip, the service was delayed, and I did not want to risk reserving my tickets to travel from Kozhikode to Bengaluru. Whats up with the title, eh? RedKnite is the call sign of AirAsia India! This flight was part of my (rather, our) return from Trivandrum. We had to book a flight from Kochi, instead of Trivandrum since flights out of TRV were very expensive (more than twice the rates out of Kochi). We hadn't opted for onboard meals, and hadn't web checked in either - since AirAsia has the habit of charging for seat selection even during check-in - very counter productive when it comes to the penny wise (pound foolish, as well) Indian public! Our return trip from Trivandrum to Bangalore was very interesting. Direct modes of transport were unviable. We were not very confident of being able to return in the evening from Trivandrum - so we had to return on Sunday. But then, we wanted to be back in Bangalore by Sunday evening - we checked flights, which were too expensive. I quickly checked for tickets from Kochi - and, bingo! The afternoon flight from Kochi had lots of tickets, and they weren't expensive either! Tickets for the flight were booked first. Then began the hunt for tickets to travel to Kochi from Trivandrum. We decided to take the Jan Shatabdi Express from Trivandrum in the morning. An urgent need to travel to Trivandrum came out of the blue. The trip was decided with just a few days to go, and the travel was on a Friday from Bengaluru! Since my brother and his family was traveling along, we had to travel by a Sleeper bus. It had to be an AC bus as well. A quick search on Redbus revealed a lot of options to pick from. We went by the ratings on redbus, and some enquiries through my friend network. I finally selected Orange Travels. Tickets weren't very cheap, and they were fairly expensive after the taxes were added. Raichur to Bengaluru: On Nanded-Bengaluru Express! I did not look 'beyond' trains for my return journey from Raichur after my exam work. I was a little confused about which train to take - the next day was 'originally' a holiday, but it turned a working day a few days later. I looked at the train options available, and finally picked up a train leaving early from Raichur and getting to Bangalore before 0600hrs. The train I picked was Nanded-Bengaluru Express. The train, peculiarly, did not have a two-tier AC coach. The options available was only three-tier AC, and First AC. I booked a three tier AC ticket, and ended up with a middle berth. This year's examination duty was taking me to two new places - Bellary and Raichur. I had traveled to Bellary and back by train (the journey was eventless, and may be I'd write about them later). 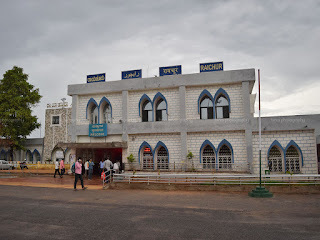 I was a little excited about my journey to Raichur - I had heard a lot about the college I'd be visiting. While the easiest option to reach Raichur was taking a train, I badly wanted to try the bus. Private operators offered only non-ac options, which I generally avoid. 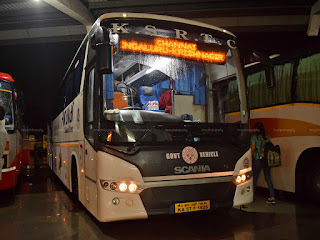 The only AC service on the route happened to be from KSRTC, which operated an Airavat Diamond Class service. I booked a ticket without much thought. I opted to take the train for my return (more on that, maybe, later). I had originally planned to spend a day in Mangalore, and travel back on Sunday night. Since I had to travel on Sunday night, I had to be quick about booking my ticket. 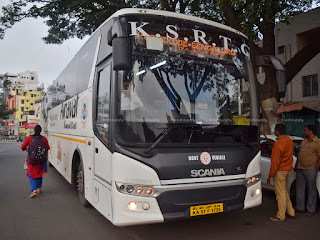 I had been traveling with private operators on all my trips to Mangalore, and I wanted to try KSRTC this time. 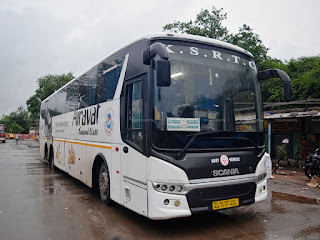 While searching for buses for Sunday night, I saw a few Airavat Diamond Class services listed. I searched the operating depot of each service, and found that one particular service was operated by Mangalore-2 depot. 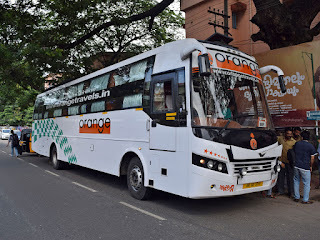 I was very particular about not traveling in buses operated by any of the Bangalore depots. I opted for that Mangalore-2 operated ADC, and booked a window seat around the middle of the coach.